After national signing day came and went, the Ducks’ newest additions are excited to begin their transition from high school to Division I college football in Eugene. And for a few special Ducks who left an indelible mark on an Oregon football program that finished the 2014 season as Pac-12 and Rose Bowl champions, a different journey continues to unfold. The NFL has released the names of draft-eligible players who have received official invitations to the 2015 NFL scouting combine in Indianapolis. A total of seven Ducks have received invitations including quarterback Marcus Mariota, offensive tackle Jake Fisher, center Hroniss Grasu, defensive back Troy Hill, cornerback Ifo Ekpre-Olomu, outside linebacker Tony Washington and defensive end Arik Armstead. A total of 44 players from the Pac-12 will represent the conference at the NFL’s annual event; Oregon and USC lead the conference with seven invitations each. 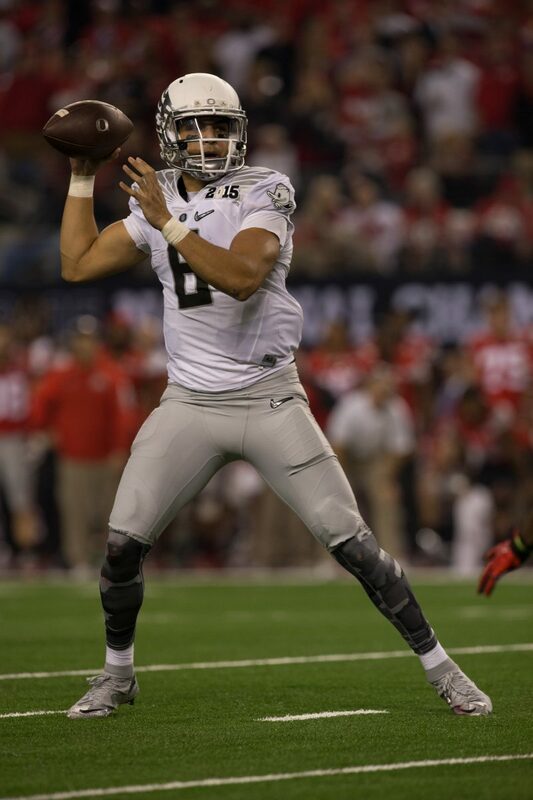 Mariota currently holds the most stock among Oregon’s invitees, listed as the possible No. 1 overall selection to the Tampa Bay Buccaneers in the Sports Illustrated 2015 mock draft board. Staff, scouts, executives and personnel from all 32 NFL teams will be present, evaluating the nation’s top players throughout this nearly week-long defacto job interview leading up to the actual 2015 NFL Draft. The event, closed to the general public, will take place between February 17-23.